Update (8/2/2012): Well, the Nexus 7 launch has been a bit problematic for some folks, myself included. A number of design or build problems have surfaced, with the most common being the issue I mentioned where the left side of the screen separates to a greater or lesser extents from its base. So far, all three of the Nexus 7’s I’ve tried (my original and two replacements) have had the issue, with the third one having the least separation. Another issue I’ve experienced is a good deal of color variation between the three, with one having a distinct and unpleasant yellow tint to whites, one have what seems like very nice white balance, and the other somewhere in between. I’m currently deciding whether to keep this third Nexus 7 or return it for a refund. If I do, then I’ll likely wait a month or two before purchasing another, to give ASUS and Google a chance to work out these initial build problems. So, I received my Nexus 7 the other day, and have been using it almost exclusively since I unboxed it and gave it a good first charge. The iPad has been used only sparingly, and mostly just to make sure it doesn’t start feeling neglected. The bottom line is, I do like the Nexus 7, and imagine it could be plenty of tablet for most people. The Nexus 7 has a number of great features, including a decent enough build quality (but not perfect, which I’ll mention in a bit), a fast Tegra 3 processor, a screen that’s bright enough, colorful enough, and crisp enough, and a comfortable form factor. It’s well worth the $249 for the 16GB version, and if you absolutely know you don’t need the storage, it’s a steal at $199 for the 8GB version. I’ve owned or tested a slew of Android tablets, and own the iPad 3. The Nexus 7 falls somewhere in the middle in terms of build quality, not quite as solid as the fused-metal-and-glass feel of the iPad but more solid than the creaking-bezel feel of the original ASUS Transformer. The buttons are responsive and tight, there are no obvious unintentional seams, and overall one doesn’t get the impression that the Nexus 7 was poorly made. There’s one exception, but I’ll cover that later on. The Nexus 7 has a very nice 7” IPS panel with 1280X800 resolution. It renders colors just fine, with colors that aren’t terribly saturated but good enough, white balance that is refreshingly neutral to my eyes, and contrast that is better than I expected. In fact, of all the Android tablets I’ve owned, I have to say that black text on a white background is the best on the Nexus 7, partly because of the decent whites and contrast and partly because of the 213PPI pixel density. 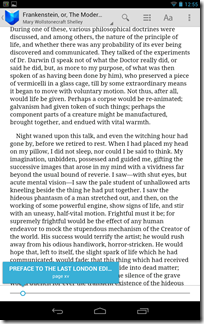 Since the Nexus 7 is going after the ebook-centric Kindle Fire, it makes sense that Google and ASUS made sure the ebook reading experience is good—and they succeeded. In fact, I’d say that the 7” size and relative light weight of the Nexus 7 makes it a superior ebook reader compared to other backlit-based tablets. The text is crisp enough that I don’t miss the iPad’s retina screen, and of course it’s far more comfortable to hold for longer reading sessions. Brightness adjusts pretty well, meaning the screen never seems too bright or too dark for comfort, and of course performance is excellent. The 7” size is also nice for gaming. Playing a first person shooter like Shadowgun on a 10.1” tablet (or the 9.7” iPad) is unwieldy at best, and tiresome. Your fingers tend to get stretched, and the weight becomes an issue over time. The Nexus 7, however, seems like the perfect size—big enough that the game remains immersive, but small enough that it’s more comfortable for fingers and thumbs. There are a few times when I miss a larger screen, such as when browsing and catching up on RSS feeds. 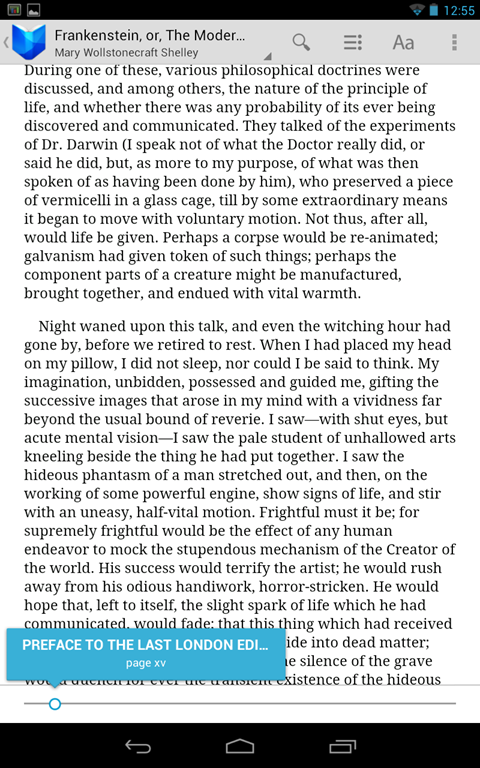 And so, contrary to my tongue-in-cheek opening paragraph, I do find myself opening up the iPad every now and then. But if I didn’t have the iPad I’d be perfectly content, particularly since Android Jelly Bean does a great job with the Chrome browser in terms of scaling text and offering pop-up zooms for smaller text links. The Nexus 7 has two speakers placed closely together on the back of the device, and they work just fine. They’re loud and clear enough for my tablet uses, where I typically only use the external speakers when in a quiet room by myself. Otherwise, I use headphones, where sound quality and volume is good if not spectacular. There’s not much to say here except that audio quality doesn’t detract from the overall Nexus 7 experience, but it doesn’t enhance it, either. 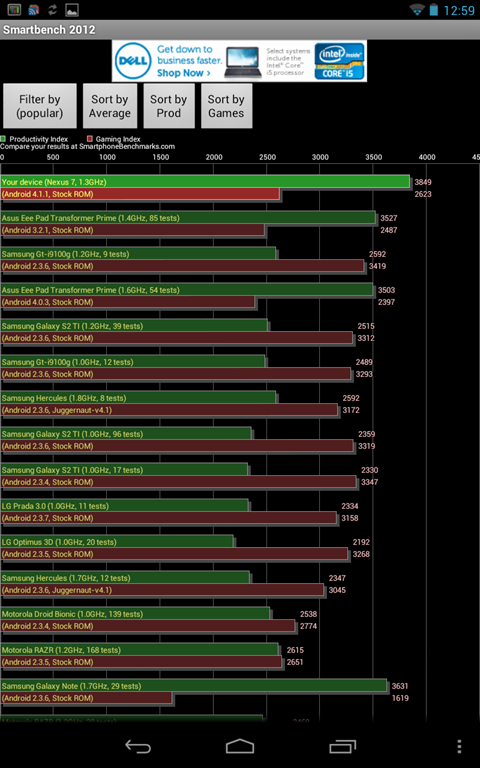 The Nexus 7 benchmarks well against other Android tablets, as seemingly thousands of reviewers have already reported. So, gaming is excellent and I’ve run across no app that makes the Nexus 7 work up a sweat. The tablet runs exactly as one would expect a Tegra 3-based tablet to run, and that’s a good thing. But more important, Google has done some remarkable things with Android Jelly Bean and their “Butter” initiative. The Nexus 7 is the first Android tablet I’ve used where I can honestly say overall responsiveness is equal to the iPad. And this is true even though Jelly Bean also introduces some nice new transition effects, where windows swoop in and out as app focus changes. At least, I think they’re new, and if they’re not then perhaps I mentally blocked them out on Android previous versions because performance was so poor. Overall, the Nexus 7 provides the lag-free and fluid experience that Android tablets need to compete with the iPad. The Nexus 7 isn’t a perfect device, however. While the negatives don’t outweigh the positives, by any means, they’re certainly worth noting. 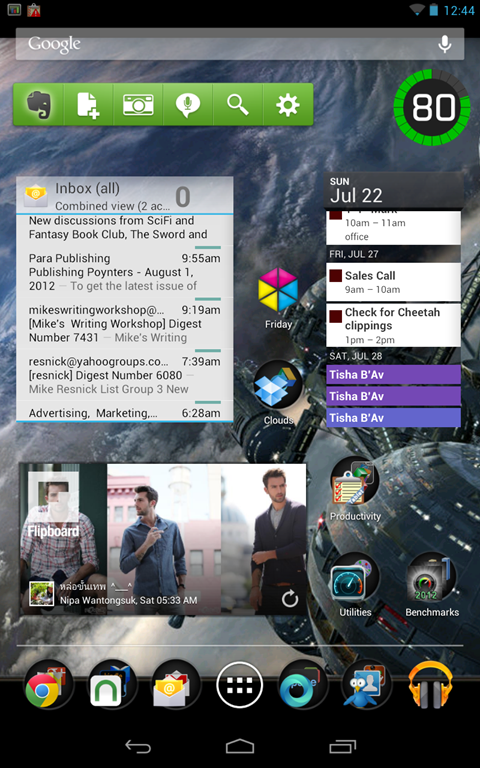 Android Jelly Bean introduced a new, hybrid UI for 7” tablets, and frankly I’m torn as to whether I think it’s a good thing or not. I’ve written before about the effect that screen size has on the tablet experience, and I’ve found the portrait-oriented launcher to make some sense on the Nexus 7 as opposed to the overly-large icons and such on 7”/7.7” tablets like the Samsung Galaxy Tab 2 7.0 and the Toshiba Excite 7.7. In fact, since tablet apps work just fine on the Nexus 7, the only real problem I have with the hybrid UI is the need to constantly physically shift the tablet from portrait to landscape. I don’t mind the top-down notification panel, although I do miss the settings shortcuts available on the landscape-oriented UI. At the same time, I do find myself using the Nexus 7 more often in portrait mode than the 10.1” tablets I’ve used, and the iPad, and so I find myself swapping orientations less often than I imagined. If you root and unlock your Nexus 7, you can change the DPI setting and force the tablet to run in the more familiar landscape mode. I haven’t felt compelled to do that yet, but I might try it at some point just to see how it works. What I think Google should do is bake in the option to run it one way or another, which would give the Nexus 7 even more flexibility over the iPad and Kindle competitors. My Nexus 7, and by many accounts a number of Nexus 7 units, have good but not perfect build quality. One common issue seems to be a slight separation of the screen from the left side (in portrait). It seems that some adhesive isn’t sticking, or perhaps some component or padding is forcing the screen to lift up. Mine isn’t as bad as some—I can tell it’s lifted slightly if I look at the screen at an obscene angle, but on some the separation is far more worrisome. I’m torn on whether or not I should replace my Nexus 7 for this problem, when everything else on it seems perfect. There’s the risk of dead/stuck pixels or other problem, but I wonder if the screen won’t continue to get worse until it becomes a real problem. Not everyone is experiencing the issue, however, and so perhaps I’ll give Google’s customer service a test. It might be interesting to see how Google does compared to Apple’s excellent experience. I’m going to mark down battery life as a negative, because I’ve found it to be a little less than I expected given the various reviews I’ve read. I haven’t quantified it yet with any precision, but the general feel I get is that it’s just not quite as good as some other Android tablets I’ve used. In particular, I’m finding standby life to be less than stellar. Whereas my ASUS Transformer Prime would burn about .5%/hour in standby (with WiFi on and email and other apps syncing in the background), the Nexus 7 seems to burn about 1.5-2%/hour. Since tablets are supposed to be instant-on, always-available devices, this means that the Nexus 7 requires charging more often if it’s going to be always available. Compare this to my iPad 3, which just the other day wasn’t used for two full days and retained 96% battery life. In use, the Nexus 7 seems about equivalent to the Samsung and Toshiba 7” class tablets. It’ll be sufficient for my needs, I think, but not stellar. 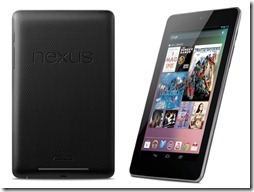 The Nexus 7 is, in my opinion, so far the best Android tablet on the market, at any price. Its form factor is perfect for one of my most common tablet uses, ebook reading, and its performance is second to none. 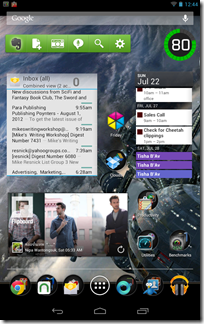 At the same time, I can’t wait to see Android Jelly Bean running on a 10.1” tablet with a true 1080P screen (e.g., the ASUS Transformer Infinity TF700). If Jelly Bean confers the same performance advantages even at higher resolutions, then I could see grabbing a larger tablet for those use cases where a 7” tablet is too small. 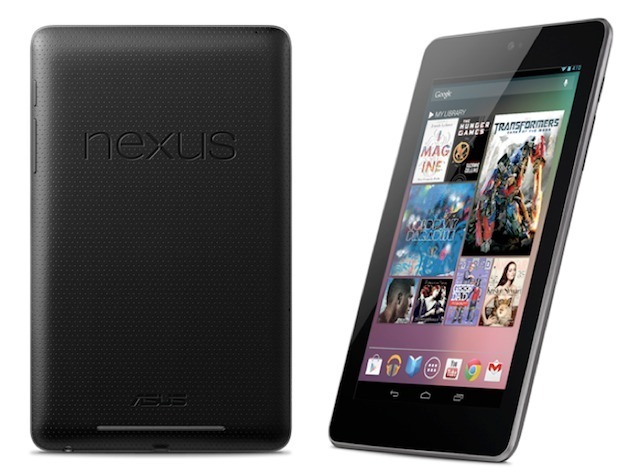 If I had to choose one tablet between the Nexus 7 and the iPad, I would choose the Nexus 7 hands-down. The iPad is a nice device with great app support, but I could get by with the Android app selection and I really do prefer Android as a tablet OS. The $249 price for the Nexus 7 makes it a much less difficult decision, where $500 or more seems like a threshold to me were I have to be much more careful. From the way the Nexus 7 seems to be selling, I’m guessing quite a few other people feel the same way.